Is Something To Be Recognized! A Trophy To Celebrate A Win Is Priceless! Show Them How Proud You Are Of Them! They Deserve A Proper Award For Their Achievement! Engravables Is There For You! Engravables is a full service engraving shop located in Valparaiso, Indiana for over 25 years. 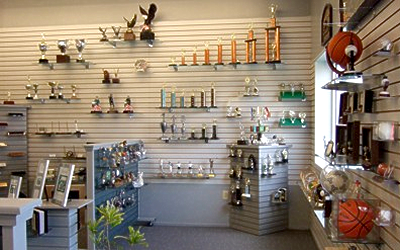 We offer a full range of products; including awards, trophies, plaques and signage to serve the needs of our community. Whether you are a small or large business, a sports team or a club, we can serve your needs with a variety of products for all occasions. We have been in business since 1988 providing quality engravable products and quick service to Northwest Indiana. Please take a moment to view our online catalogs by going to the Products page. Copyright © Engravables. All Rights Reserved.